* In the mail yesterday, the first hot-off-the-presses copy of Mighty Casey! * In the mail today, the first-pass galleys to Bystander (Fall, ’09), my “bully book” set in a middle school. To me, this is more exciting, because we’re in the thick of it. Here’s my first chance to see this book set in type. I’ll see the typeface, the way they handled chapter openings, the leading, margin width, the feel and heft of the whole thing. I’ll find out how it pages out, the length. And I’ll read it through again, pen in hand, for the 50th time (approximation). This pass represents my last chance to make corrections before it goes to bound galleys, otherwise known as “uncorrected” review copies. Even so, there will be more opportunities to overthink the whole thing. 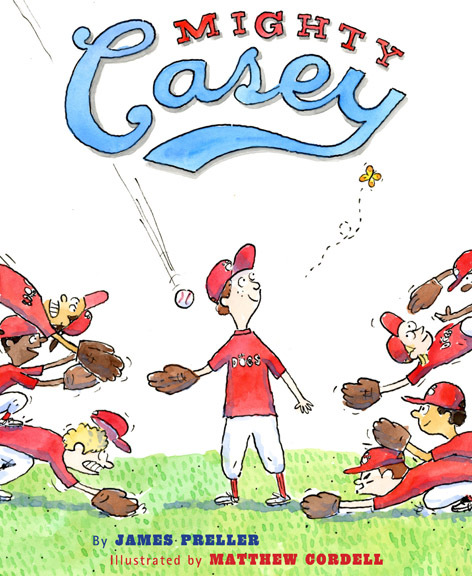 The lifelong friendship between two fifth graders—one with a mild spectrum disorder—hits the rocks but emerges intact in this perceptive tale from the author of Six Innings (2008). Feeling conflicted but wanting to fit in better with his classmates at Spiro T. Agnew Elementary, Robert (nicknamed Spider) uncomfortably tries to put some distance between himself and his buddy Trey, whose obsessions, lack of sensitivity to social cues, and general clumsiness have resulted in a reputation for being “out there.” Acting on Spider’s suggestion that he make other friends, Trey beats the odds and finds two: the school’s young librarian and a genial new classmate named Ava. Spider also makes another friend, and by the end discovers that there’s still room in his life for Trey. By regularly switching points of view, Preller gives readers a chance to see the situation from each boy’s angle and to consider the central insight that differences aren’t always as important as they seem. * I posted yesterday about Jigsaw Jones: The Case of the Secret Skeleton. Scholastic is in the process of making the cover. And since I’m working with a new editor on this one, I need to check in and make sure I’ll get another chance to make corrections in galleys. Because — get this — it’s not perfect. * Amidst all this background noise, I’m supposed to be writing a new book. I’m in the early stages of Joker (a working title I’m not loving), which mostly means jotting down notes, reading things, daydreaming, hoping to sort out in my mind some kind of shape and scope of this thing before jumping in with both feet. I want it to be funny, and that’s so much easier to describe than actually pull off. I don’t have the voice yet. Now I just kind of write and think, “This so blows.” I guess you could say we’re in the Self-Loathing Stage. Always fun. This is a lot of “you”, but it all seems to be good stuff (except the self-loathing!). I’m thrilled that Booklist got a review of Along Came Spider. I loved that book from the moment I read it! I am really looking forward to reading it to my students in January!! Karen, thank you for reading this blog; I’m grateful for all of your comments. At first when this became, I had that sense of talking in an empty room — but I kept talking anyway. You were one of the first to care, along with Nan and Liz and Doret, and that’s why you will soon be receiving a FREE Amana 1100 Watts Microwave Over, delivered directly to your home! Or, um, not. Anyway, I am grateful for your support of Spider.